The first time you see and photograph one of these beauties will be a day that you will remember for a long time to come. To this day, my heart skips a beat every time I am fortunate enough to see and photograph this bird. Where, when, why and how? There certainly is a lot more to it than just pointing the camera and shooting! Consider that most of us are willing to go to great lengths and expenses to get the shot of a particular species that we covet and want in our collection, and to share with others, like you. 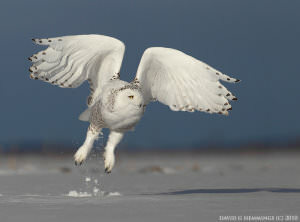 Take these images of the Snowy Owl for example. Here is some of what went into getting these shots. And then there are other factors, such as temperature. The temperature was a bone chilling -18 degrees Celsius with a wind chill factor thrown in that made it so cold that the tears from my cold eyes froze to my eyelids before they could run down my cheek. I could not feel my toes or the ends of my fingers very well, just enough to click the shutter when I had to. Many of us will travel half way around the globe in search of an image of a particular species in flight. For me, this time, it was only a 6 or 7 hour drive into Northern Quebec, Canada. 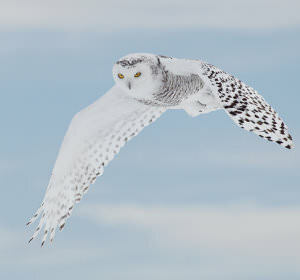 The first day we did not find the Snowy Owl that had been seen in the area in previous days/weeks. 8 hours of hiking and driving in the freezing cold with nothing to show for it. Success finds us on the second day. We find one owl and go to work setting up to get the photos. 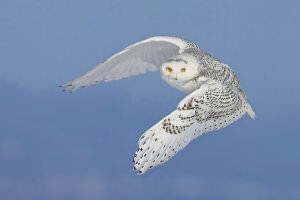 It is so cold that it is hard to look into the wind to see the owl. Then you have to lift a rather bulky and heavy camera body and lens up to your face and follow where the bird id flying. It hurts to do this a few times in a row, but you have to get the shot. You have to have a steady hand and a good technique in order to do what you came to do. In the freezing cold, you have to take light readings and adjust all of the settings on your camera for the desired result. You have to take your gloves off and touch the camera body that is colder than ice to accomplish this. You can hardly see through your freezing eyes and there is not much feeling left in your fingers, but the bird is flying and you have to get that shot! This made all of the travel, the freezing cold conditions and the effort more than worth while. 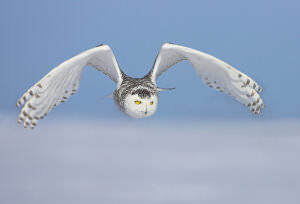 So, the next time you see an amazing image of a Snowy Owl in flight, the expression “he was lucky to be in the right place at the right time” has a whole new meaning. 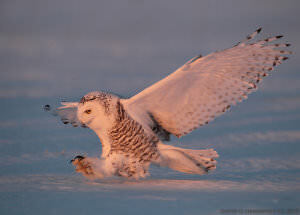 Voice: The Snowy Owl is virtually silent during nonbreeding seasons. The typical call of the male is a loud, harsh, grating bark, while the female has a similar higher pitched call. 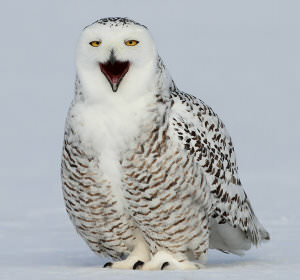 During the breeding season males have a loud, booming "hoo, hoo" given as a territorial advertisement or mating call. Females rarely hoot. Its attack call is a guttural "krufff-guh-guh-guk". When excited it may emit a loud "hooo-uh, hooo-uh, hooo-uh, wuh-wuh-wuh". Other sounds are dog-like barks, rattling cackles, shrieks, hissing, and bill-snapping. David Hemmings is the owner of Nature’s Photo Adventures. His company offers bird and nature photography workshops all over the world. David leads many of the workshops himself. Visit the NPA website for more details on how to participate.